Condition New, High quality, Safe! Product Condition: Brand new in bulk packaging. OEM equivalent part. Order your HP Compaq BUSINESS NOTEBOOK NX6100 battery before 2:30PM we can ship the same day. Battery Tips: Lithium ion notebook batteries normally offer 300 to 500+ charge/discharge cycles over one year of useful life.After over one year, the battery will end up with very low capacity and this renders the battery unusable. As soon as the battery leaves the production line it is likely to start losing it's capacity. So How can you make your laptop battery last a long time? New laptop batteries generally arrive in a discharged state, so, before you use them first time, you had batter charge your HP Compaq BUSINESS NOTEBOOK NX6100 laptop batteries up for at least four hours. Don’t run out of your HP NX6100 battery. Lithium Ion laptop batteries work best when they are recharged while they still have 10 to 20% capacity remaining. So if you are using your notebook battery on your journey, try not to get in the habit of using the notebook battery until it has almost no charge. Make sure the vents in your the laptop are not blocked and the laptop does not overheat. Extreme heat causes the increases the self-discharge rate of the battery. When carrying the battery. Do not short circuit the terminals or store your battery pack with metal objects such as necklaces or hairpins. Don't use the laptop battery unless you have to! Li-ion batteries degrade or deteriorate continuously it have a life of about 300-500+ recharge cycles or about one year, the battery will end up with very low capacity and this renders the battery unusable. Many people keep their laptop plugged in all the time, that’s not good. If your HP Compaq NX6100 battery will not be in use it should be removed from your laptop and stored in an Anti-Static bag and in a dry, cool place. make sure it is has about 40 - 50% charge and it is highly recommended to circle it at least once a month. Do not disassemble the HP Compaq Business Notebook NX6100 Series battery , the contents may be corrosive and harmful for your health. Description 4400mAh capacity HP Compaq BUSINESS NOTEBOOK NX6100 battery for HP Compaq BUSINESS NOTEBOOK NX6100 Laptops, Replacement your laptop with this excellent and low price HP Compaq NX6100 battery. This Replacement HP NX6100 battery can fit for your HP Compaq Business Notebook NX6100 Series / Business Notebook NX6105 / Business Notebook NX6110 / Business Notebook NX6110/CT / Business Notebook NX6115 / Business Notebook NX6120 / Business Notebook NX6125 / Business Notebook NX6140 / Business Notebook NX6300 Series / and more laptops. 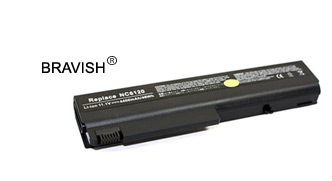 Our HP Compaq NX6100 laptop battery is designed to be fully compatible with the original equipment. And all the HP Compaq NX6100 batteries are 1 year warranty and money back in 30 days.